Series of standard IEC motors with three-phase power supply, cl. F insulation and IP 55 protection class (or IP54 in the larger sizes). Characterised by a high degree of reliability, they can be used in countless application solutions. Brake motors are made with the application of an electromagnetic disc-brake onto an A.C. motor which operates in case of lack of current causing the blocking of the motor and of the other devices connected to it. The brake motor grants a high stop precision in case of voluntary interruption of current; it grants also a high safety margin should the interruption be accidental. Braking pressure is effected in a very fast way from one or more springs once the electromagnet stops its action. The principal characteristics can be summed up as follows: - double extended shaft; - possibility of brake separate feeding. This solution is advisable on two speed motors and when an inverter is used. 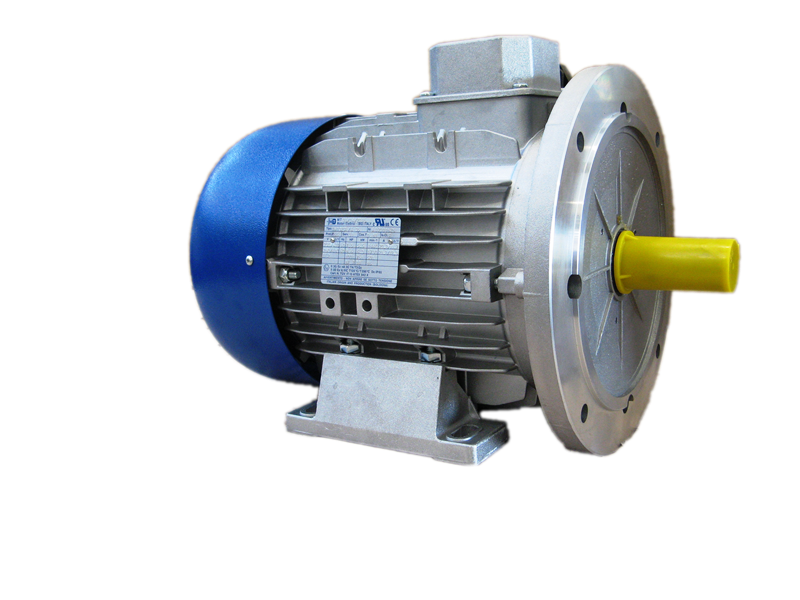 This motor is equipped with an electromagnetic springs brake, it works with a.c. and the disk brake has double braking surface. This motor has been projected to achieve the highest release and braking precision, the maximum braking frequency and high starting frequency. All the motors are provided with the screw for the brake hand release. The motors of TFS range are equipped with an electromagnetic standing brake, a c.c. coil and fixed braking torque. The brake feeding is directly connected to the motor terminal board by a rectifier (in this way the brake automatically release once you feed the motor). IIt is possible to adopt brakes with separate feeding, in the same way as it happens with two speed motors or motors working through inverters. This kind of brake takes up little space, so the resulting motor lenght is just a little bit superior to the one of TN range motors. MN single phase motors are equipped with a run capacitor permanently turned on and connected to the auxiliary winding for starting. Overall dimensions are identical to the threephase motors, except for the capacitor. The capacitors is assembled on to an appropriate support that enables to isolate it from the housing limiting the trasmission of temperature and vibrations to the capacitor itself. MF single phase motors are equipped with a run capacitor permanently turned on and connected to the auxiliary winding for starting. Overall dimensions are identical to the threephase motors, except for the capacitor. The capacitors is assembled on to an appropriate support that enables to isolate it from the housing limiting the trasmission of temperature and vibrations to the capacitor itself.